Globally, the aviation industry narrative in 2017 was demonstrative of both record profits and excellent passenger growth. The European aviation market was no exception, surpassing even the most bullish forecasts. The rise of LCCs and market consolidation, resulting in stronger and – in some cases – fiercer airline groups, resulted in the continent shaking the traditional notion of confined growth in mature aviation markets. The remarkable passenger growth rate of 8.2% year-on-year was near double the 4.8% posted in the USA, and just short of the Asia Pacific’s 9.4%. Europe’s air traffic management (ATM) network added 4.4% more movements in 2017, bringing the total to 10.6 million for the year. Overseen by the Eurocontrol Network Manager (NM), the European ATM network covers 43 countries – but despite this growth, the NM area continues to miss performance targets and has not met airspace objectives to meet ballooning passenger demand. The European aviation network performance was healthy in 2017 but industrial action and capacity issues are impeding, and will continue to impede, growth. Delays totalled 9.3 million minutes in 2017, with already 4.3 million more recorded so far in 2018. Up to 14.3 million minutes of delay expected for 2018 – a 53% y-o-y deterioration. The biggest contributor to delay is en route ATC capacity, but infrastructure as a whole is a major issue. The capacity gap will prevent achieving the 1.5 million forecast movements by 2040. ANSPs need to work towards a Single European Sky. The European Commission and other authorities are seeking to minimise the effect of local industrial action on the wider European aviation network, but the real issue is adding capacity at both ATM and airports. Looking to the busiest period for the European airline industry, the months of Jul/Aug/Sep-2017 had the highest monthly traffic ever recorded, each totalling more than one million flights. Specifically, for the month of Jul-2017, there were on average 33,721 movements per day, the highest of the year. This represented an increase of 5.2%, which surpassed the high forecast scenario for the network. However, during the highest demand period, en route air traffic flow management (ATFM) delay also reached its yearly peak at 1.98 minutes per movement. Eurocontrol attributed weather as the main driver for this increase, but at the area control centres (ACCs) of Karlsruhe, Marseille, Brest and Nicosia high delays were largely due to capacity, industrial action and staffing issues. Overall, en route ATFM delay actually only increased from 0.86 min/flight to 0.88 min/flight from 2016 to 2017. 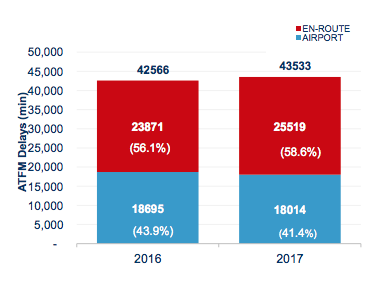 Despite this slight decline, total delay in the European aviation network in 2017 aggregated to 9.3 million minutes, a level of disruption fundamentally in conflict with aspirations for the European aviation market continuing to flourish. Average daily ATFM delay increased by 2.3%, while average daily en route ATFM delay increased by 6.9%. Average daily airport ATFM delay meanwhile decreased by 3.6%. SOURCE: Eurocontrol reports and CAPA - Centre for Aviation. Already in 2018 – a year subject to an abundance of strikes, capacity/staffing shortages and weather impediments – Eurocontrol expects 14.3 million minutes of delay, which is a 53% year-on-year deterioration on what was already a dreadful year. The EU target delay for 2018 is an average of 0.5 minutes per flight, but according to current forecasts, the European NM area is now on track to triple this. According to a study carried out by the University of Westminster, one minute of delay incurs operating overheads of EUR70. This means delays in the European aviation network will exceed EUR1 billion in costs in 2018, if forecasts are met. With margins as slim as those in the airline industry and rising oil prices, a reduction in delays would not only meet the ever-increasing demands of passengers from a service standpoint, but could also lift the profitability of the airline industry as a whole. Environmentally too, for emission reduction-conscious governments, imposing 14 million minutes of added flying is clearly unacceptable. En route ATC capacity accounted for 25.5% delays in 2017, and airport capacity another 15.5% of interruptions. This means general capacity issues in Europe accounted for 41% of delays during the year. 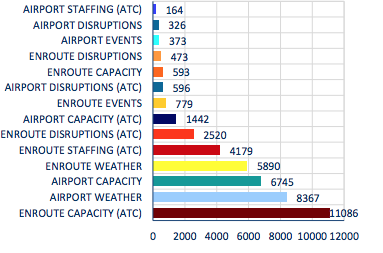 The influence of weather on en route and airport operations collectively total 32.7% of delays; that is, the bulk of airspace interruptions are clearly derived from controllable factors. SOURCE: Eurocontrol reports and CAPA – Centre for Aviation. The figures reflect a palpable concern – European airports and air traffic management capacities are falling behind the demands of the sector. There is little sign of this changing in the short term, according to the CAPA Airport Construction Database. European airport investment activity for projects completed in 2017 summed to just USD3.3 billion – inferior to any other region. Asia boasted the most financing, with USD6.2 billion in existing airport construction projects. In its most recent ‘Challenges of Growth’ report, Eurocontrol presents a series of scenarios foretelling how airports will not be able to facilitate growth with the current levels of investment. In the most likely scenario, which suggests an average of 1.9% more movements p/a from 2018 to 2040, 16.2 million more airspace movements would be added – or 53% more flights for Europe. Under Eurocontrol's most likely scenario (which as noted was well below actuals in 2017), the European aviation system would fail to facilitate 1.5 million services - or 160 million passengers - p/a by 2040. A much greater impact would occur under Eurocontrol’s high forecast scenario, which would see movements grow as much as 84% by 2040. The French Parliament recently tabled a new research report on the state air navigation service provider Direction des Services de la Navigation Aérienne (DSNA), authored and endorsed by French Senator for Seine-Saint-Denis Mr Vincent Capo-Canellas. The report highlights DSNA-managed aircraft movements expanded 4% in 2017, and in French aviation as a whole there has been a "surge" in demand. However, industrial issues and a surprising lag in acquiring new ATC technology has positioned DSNA in a challenging situation. The Senate report criticises DSNA for “mixed results” in meeting its own carbon footprint and aircraft trajectory targets, along with being unable to address wider European airspace fragmentation issues. DSNA’s environmental performance is up to 20% lower than that of its European counterparts – the report suggests – while strikes, particularly in the Marseille area control centre, are causing a calamitous impact, not only for French air traffic but also for overflights over the Mediterranean and on many services to/from Spain. According to Eurocontrol data, DSNA accounted for 33.4% of all delay minutes in the NM area in 2017, representing a loss of EUR300 million in cost overheads. Furthermore, the ANSP was responsible for 41.6% of delays in 2016. Many French ATC stations have still not adopted current technology, with most still not equipped with an all-electronic environment, often still opting for the use of paper strips. Eurocontrol predicts achieving 12.4 million IFR flight movements in Europe as early as 2024, 17% more than in 2017. Capacity will continue to be the main impediment to efficiency, and evidently will become an obstacle to meeting traffic forecasts in the future. A genuine Single European Sky, will require movement by stakeholders to implement new ATM technologies, while working to facilitate data sharing to improve airspace - collectively rather than in a segmented approach. Governments and other authorities must accompany this with complementary regulatory practices, or risk foregoing the economic development associated with Europe’s robust aviation industry - as well as causing significant and unnecessary environmental damage.